Last October, the Exploring Artism program focused on the sense of hearing to help us better understand certain paintings. To start off our session, we talked about some of our favorite sounds. Here is our warm-up worksheet; we listened to various music selections while completing this worksheet. After talking about our favorite sounds, and elaborating on why we love those sounds, we went into the galleries to look at sound in a painting. 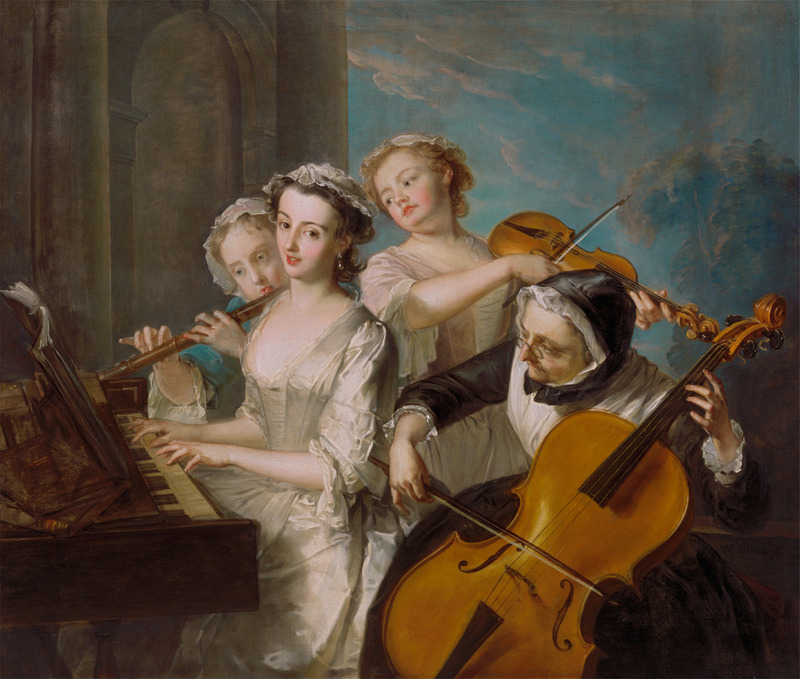 In the fourth floor gallery, we looked at this painting by Philippe Mercier called The Sense of Hearing. Philippe Mercier, 1689 or 1691-1760. The Sense of Hearing. 1744-1747. Jaime shared an important piece of advice for looking at the painting: “You don’t need to know anything about art to have a good time. All you need to do is use your eyes to look at the art, use your mouth to answer questions, and use your ears to listen to what other people have to say.” Looking at the painting, we asked ourselves: What do you see? What instruments do we see? Do you know what sound each instrument makes? Using several apps on our two iPads, we were able to replicate the sounds of the instruments in the painting. Here are the links to the various apps that we used in our program: Harpsichord, Flute Dots, Violin, Cello. We also looked at a worksheet with pictures of each of the instruments. Everyone had a lot of fun using the iPads to recreate the music that we see within the painting. Next we talked about how we can make music without instruments. Using our hands and mouth, we can come up with a variety of different sounds. Using these flashcards, every family created their own sound pattern. Once each family made their sound pattern (using hand claps, knee slaps, lip smacks, and a creative sound), everyone had the opportunity to present their sound pattern to the group. All together, our Exploring Artism group made a sound “symphony.” Using actual sounds within the gallery helps us to understand the artwork on a multi-sensory level. The audible and visual experience pushes us to think further about what happens within a painting.